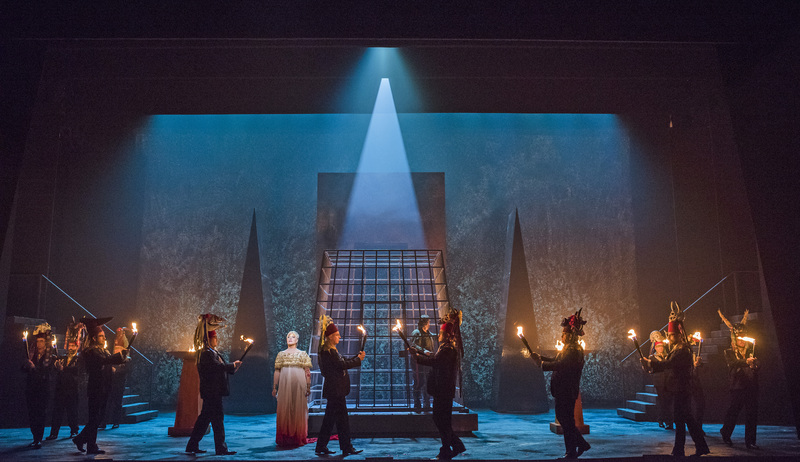 Tonight’s Aida marked the opening of English National Opera’s 2017 – 18 season and this is a company that continues to experience considerable turbulence. With the number of performances significantly reduced, the splendid chorus reduced to part-time contracts and the house given over to musicals for much of the season, it strikes me that ENO is very much a company is search of a mission. So many of the comments about the company hark back to a glorious past with a company ethos and a loyal audience. And yet, in many ways the world has moved on. Despite Mrs May’s best efforts, almost 40% of Londoners were born overseas and English can no longer be assumed to be the language of the audience. If only ENO could gain a visionary such as Barrie Kosky who has transformed the Komische Oper in Berlin to be what I would argue ENO needs to be – a house with a strong company ethos, performing a wide range of repertoire in the original language from opera to musicals to concerts. That sense of mission, of being as much about the city as much as the art, appears to be missing from St Martin’s Lane – understandably so given the turbulent waters the company has experienced over the last few years. I start with these thoughts because this Aida is above all a showcase for that magnificent chorus, on blistering form tonight. They sang as if it was not just any other job but rather because it was their mission to sing. In its chorus, ENO has its greatest ambassadors. Their enthusiasm with theatre-filling sound, their professionalism with staggeringly accurate pitching from the gentlemen in the unaccompanied sections in Act 1, and their sheer commitment to everything asked from them inspired admiration. As for Phelim McDermott’s staging, it certainly gave a good show. 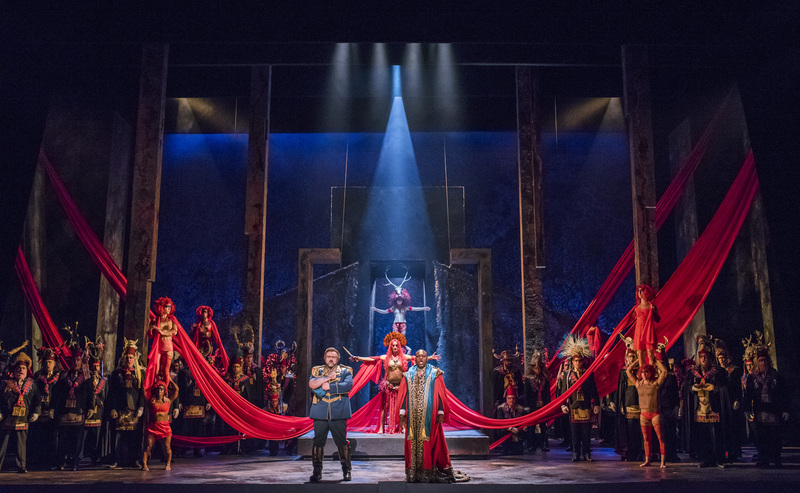 There was much spectacle with the stage populated with the chorus and actors in the triumphal scene and a striking staging of the tomb scene at the end. The visuals offered much to the eye – redolent of sci-fi meets Halloween, with the chorus ladies going full gothic chic with ornate headdresses. 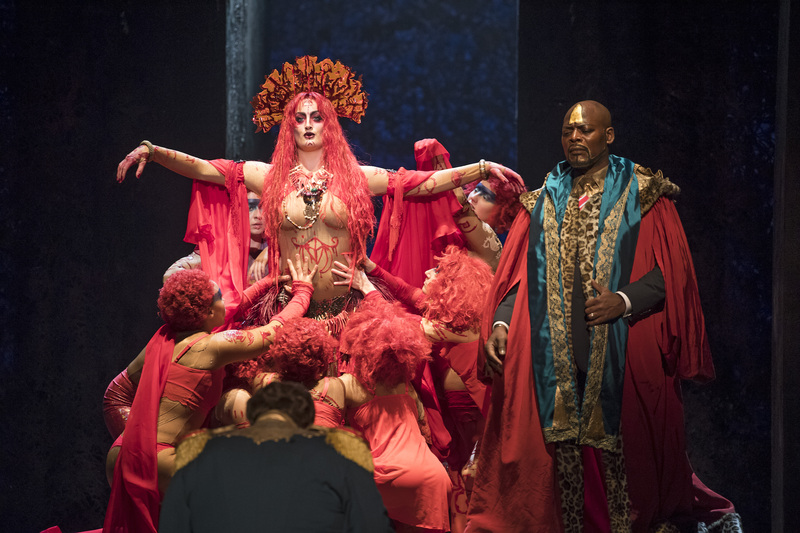 Michelle DeYoung’s Amneris suffered most from the costuming, with a flowing white outfit with huge sleeves that, with arms outstretched, made her look as if she was about to take off. The Priestess also looked like she had taken a wrong turn on the way to the Moulin Rouge. Yet despite this visual interest, far too often, principals were parked at the front to deliver their arias in front of a black drape, behind which noisy scene changes took place. This was a staging driven by the visuals instead of narrative impetus – in most cases, I never really got a sense of who the characters were, nor was there an overwhelming sense of a drama hurtling to its conclusion. I longed for a cogent narrative, something to strip away the layers and reveal the drama behind the spectacle. Perhaps with stronger direction of the principals and less implacable standing and delivering, in many respects we might have had that. DeYoung’s Amneris was soft-grained and somewhat plummy in tone. Her diction was foggy with vowels being distorted to produce an admirable line. Even when delivering lines such as ‘slave, you are nothing’, they were dispatched with the same generalized reverie with which she sang everything else. I’m not convinced the role sits in a comfortable place for DeYoung’s mezzo – the middle was frequently inaudible and the physical tension required to produce the top was visible in her shoulders looking very tight. Still, it’s an attractive instrument even if tonight regrettably did not give the impression of DeYoung at her considerable best. 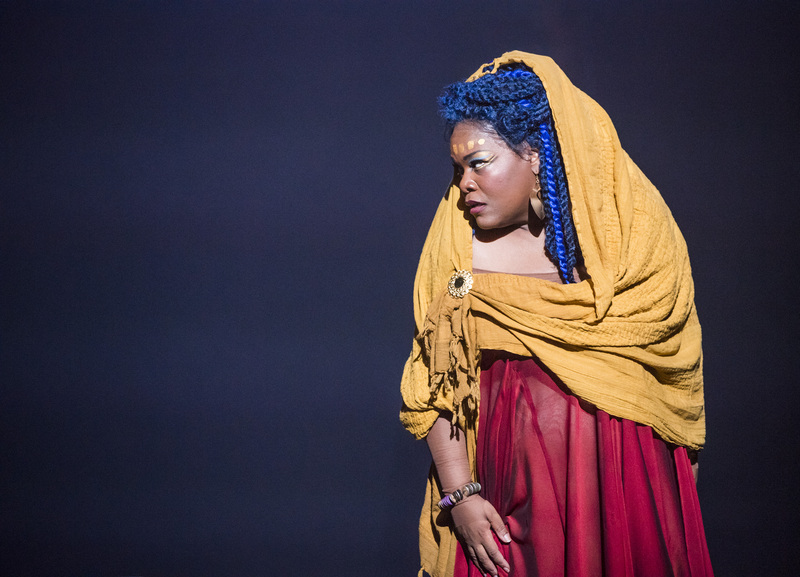 Aida is something of a signature role for Latonia Moore, having sung it around a hundred times in the original. Her affinity with the role was clear – even when parked at the front, she filled the words with meaning, the voice bright with a silvery, cutting edge. She transcended the staging, creating a believable character – both loving and cunning. ‘Ritorna vincitor’ was inclined to sharpness as if pushing the voice, perhaps through nerves, but she soared gloriously over the ensemble in the triumphal scene. Her ‘o patria mia’ was extrovert rather than floated and I did long for her to pull back and float at the top. She was unafraid to give us some chest but the break was obvious at times. Moore, however, is a notable talent. Gwyn Hughes Jones gave us a reliable and generously-sung Radamès. It was a pleasure to hear ‘celeste Aida’ caressed with love and closed with an impressive diminuendo. I left with the sense that the role is somewhat too large for him, however, the voice occasionally pushed with the inevitable effect on pitch but he was always highly musical and honestly sung. 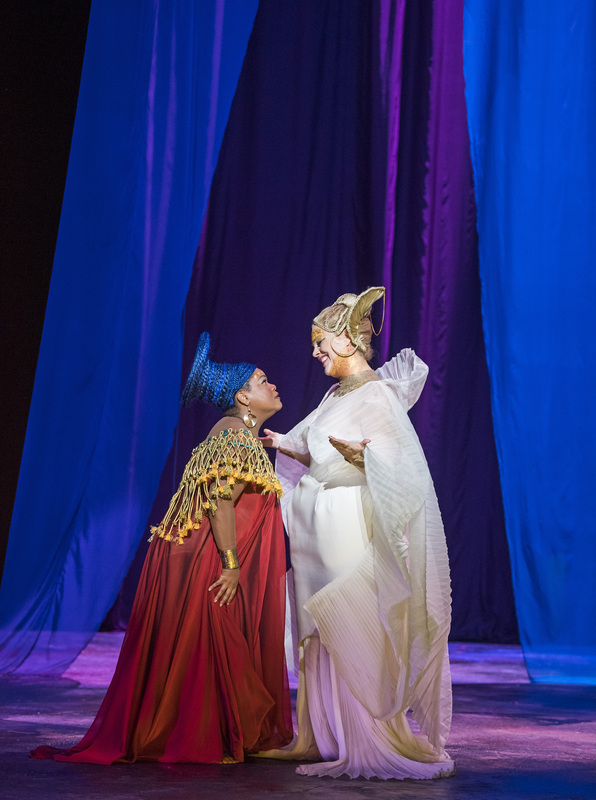 The remainder of the cast was perfectly adequate – Musa Ngqungwana’s Amonasro somewhat dry but certainly engaged with the text and Eleanor Dennis a glamorously-voiced Priestess, with an attractive tone. Robert Winslade Anderson, an ENO chorus member, sang Ramfis with dignity. Keri-Lynn Wilson led a vigorous and lively reading – occasionally catching the strings off guard with some very swift tempi. Not afraid to pull back in places, there were occasional dips in tension when she needed to do so to let some voices through. Hers was an extrovert, brassy reading with attack sharp and a thorough sense of the score’s trajectory. The orchestra played decently for her with occasional lapses in tuning in the strings. 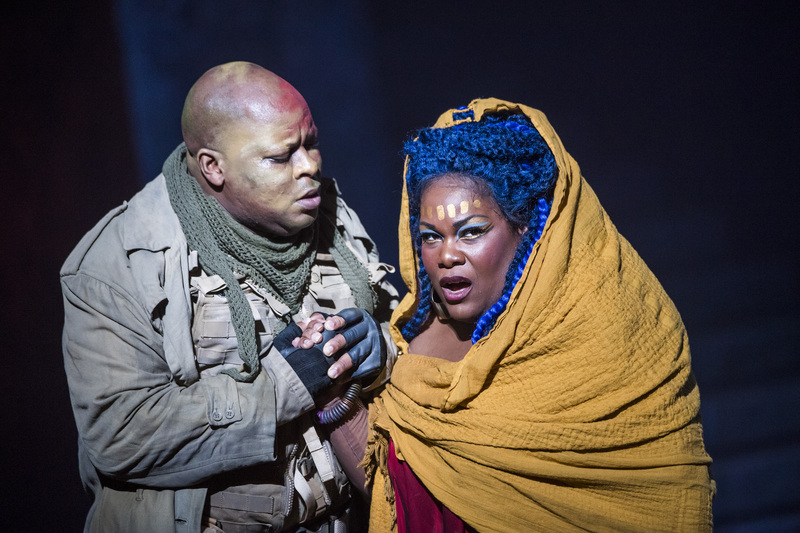 There was much that was good in tonight’s Aida – Moore’s assumption of the role would be at home in any leading theatre and Hughes Jones’ honestly sung Radamès had much to offer. 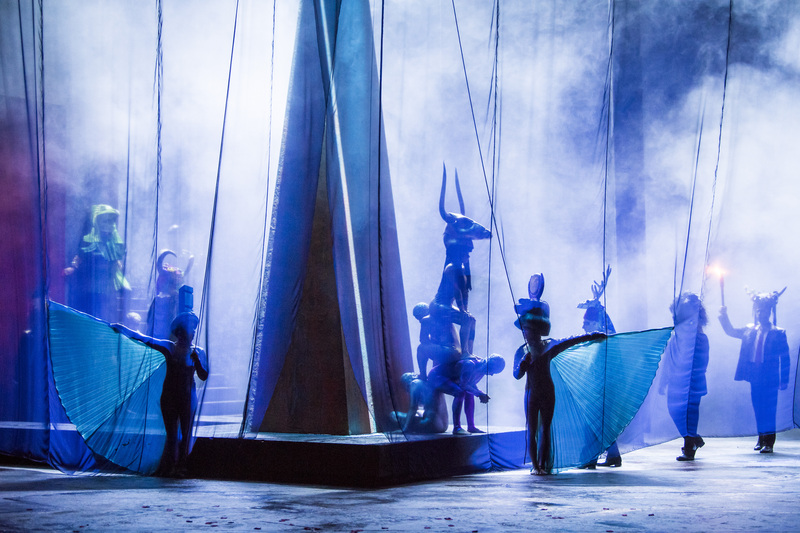 The staging offered imposing visuals but the drama came mostly from the pit. The most impressive, however, was the singing of ENO’s chorus who truly sang with missionary zeal tonight.